Today I have some exciting news to share with you. We are releasing some new features with new functionality and improving account security. So far this is the most exciting feature we have released in the past 3 month, opening great opportunities for Merchants and Market-places. In short, it allows you to transfer money to other bank accounts directly from your Omise balance, by using Omise API. This feature can be used as a "Payout" method for your sub-merchants or for distributing money to different bank accounts. To create a recipient, you will have to authenticate in Omise dashboard and approve each recipient manually for added security. 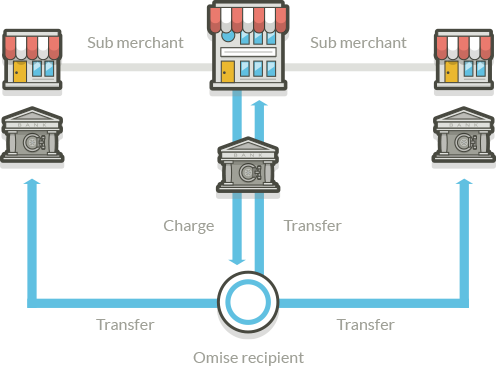 Once the recipient is active and approved, you can then use Omise /recipients API for transferring money to those accounts whenever you need. We have developed an Opencart extension for supporting Omise Payment Gateway. If you have an OpenCart store you can install Omise OpenCart and start receiving payments right now. Omise gateway is now officially part of ActiveMerchant Rubygem Version 1.50.0. You can use ActiveMerchant in your Ruby project or in any ready to use Ruby e-commerce platforms such as SpreeCommerce or Radiant Shop. We're adding MFA (Multi Factor Authentication) support to all accounts for improved security, supporting any Google Authenticator compatible application. Coming soon, this feature will be live next Monday. When enabling MFA on your account we will generate 10 backups codes for you to use in case your phone is lost or not accessible. *Less than 100% comes from our planned downtime maintenance on March 23. For us, 100% uptime is an obsession and mission. No lost transactions! We have switched to HelpScout and we’re very happy with it so far. All support tickets are broadcasted to whole team, and everyone can reply anytime. This is more transparent and our reply time is much faster. At Omise, providing the best support for you is our #1 priority.